(Latest Updated on 06.05.2018). Learn important objective type multiple choice question answers on English Literature for UGC NET/STET/HTET/TGT/PGT English. Candidates who are appearing in STET/UGC NET English, HTET PGT English or DSSSB/RPSC/HSSC TGT/PGT English objective written exam can use these English Literature Question-Answers as English Study Notes and English Literature Study Material. 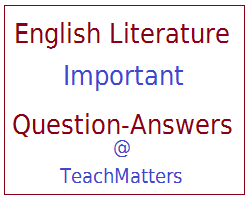 See important question answers on English Literature for all competitive objective type written exams. 32. John Lyly’s Euphues, the Anatomy of Wit was published in 1579 and was contemporary with – Shepheardes Calender. Note : This list of question answers will be updated at regular intervals, so stay tuned with us and visit this page regularly.